At a time when liberal arts education seems increasingly imperiled by the rise of career-focused and STEM programs, Belmont Abbey College in Belmont, North Carolina has recently founded the Honors College, a program dedicated to reading and discussing the Great Books of the Western tradition. Shaun Rieley, ACTA’s Program Officer for Trustee and Legislative Affairs, sat down with the director of the College, Dr. Joseph Wysocki, to get his take on the continuing importance of Great Books and liberal arts in the modern world. Where are you from? Where did you go to school? What did you study? I was born on Long Island, NY and lived there until my family moved to High Point, NC when I was fifteen. My desire to attend a Catholic college relatively close to home brought me to enroll at Belmont Abbey College in 2000, where I studied political science and economics. More importantly, I met Dr. Gene Thuot, the director of the Honors Program which was a precursor to our new Great Books Honors College. Through his teaching great books courses and the diligent attention he paid to his students, he planted in me the seeds of my love for great books. Fortunately, he is still teaching at the Abbey, as it was largely his wisdom, distilled from his many years of teaching great books, which shaped our new Honors College. In 2005, at his recommendation, I entered a newly established doctoral program at Baylor University, where I studied political philosophy and American Politics with David and Mary Nichols. The Nichols’ dedication to their students and approach to the discipline of political science continued to foster my love for great books. 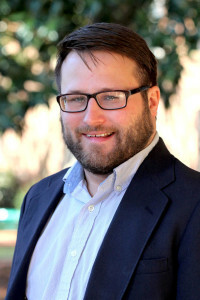 I have been back at Belmont Abbey teaching in the Government Department since 2010 and currently serve as the Assistant Dean for Academic Affairs and Director of the Honors College. Recent trends in higher education have emphasized the importance of STEM education and career-focused education. You, on the other hand, have recently helped to start a liberal arts program focused on reading and discussing the “great books” of the Western tradition. Why great books? Why now? I would begin by saying that I don’t view our program as standing in opposition to the legitimate goods provided by a STEM education. Rather, in a curriculum like ours, the fundamental questions raised by STEM disciplines are integrated into the “great conversation” among the ancients, Christians, and moderns. Students in our Honors College will be required to take two lab science courses and a course dedicated completely to Euclid’s Elements during their freshman year. During the spring semester of their sophomore year, which focuses on great modern texts, students will read Galileo and Bacon. During our distinctive senior year centered on topical courses concerning what we call the “crises of the West,” students will read authors such as Heisenberg and Arthur Eddington in their course entitled “Science and Technology.” Additionally, students will have the ability to choose a curricular option that will allow them to take a traditional Belmont Abbey College major, including the STEM majors we offer, along with the great books core of the program. So why great books? I would say that a great books education, at its best, exposes students to the best “inquirers” in the Western Tradition. Scientists and mathematicians are certainly inquirers. The best of them seek wisdom about nature, God, human beings and the relationship between them. However, there are other ways of inquiring into these realities. The great poets, philosophers, historians, and theologians for example, can all seek and disseminate wisdom about these matters as well. So to bring us back to the question, a great books program helps students to understand that limiting education to STEM disciplines limits the bounds of reason and the access to fundamental human questions and potential answers to these questions. One might say that from the standpoint of those who espouse a great books pedagogy, science is not at all problematic, but scientism—which St. John Paul the II describes in his encyclical Fides et Ratio as “the philosophical notion which refuses to admit the validity of forms of knowledge other than those of the positive sciences; and…relegates religious, theological, ethical and aesthetic knowledge to the realm of mere fantasy”—is. The collapse of the humanities—whether the decline in those studying them, or their being captured by certain kinds of identity politics—have been much discussed. How do you find scholars who are both interested in teaching great books and who are qualified to do so? Let me begin by responding to the last part of the question first. A great books approach to a teaching qualifications is, one might say, radically at odds with a conventional understanding of teaching qualifications. The conventional position in higher education is that courses in disciplines and sub-fields within those disciplines should be taught by faculty who have specialized in those fields in graduate school. A great books pedagogy views the authors of great texts as speaking to human beings who are willing and able to pursue wisdom about the greatest matters. Aristotle and Thucydides, for example, didn’t write their Nicomachean Ethics and History of the Peloponnesian War for academic philosophers and historians, but for those open to inquiring about the best way of life, the nature of war, and freedom. If this is true, then academic specialization, while perhaps helpful at times, is less important than certain moral and intellectual virtues possessed by a teacher. Primarily, good instructors of great books must be moved in their own intellectual pursuits by a desire to grow in wisdom concerning fundamental human questions. Secondarily, they must possess the humility to believe that they are not the teachers in a course. Rather, the author of the text is the teacher, while the instructors serve as more experienced students, there to guide new students in their own reading. Finally, along with a desire for wisdom and humility before the text, instructors must practice slow and deliberate reading and careful preparation of their seminars or lectures in order to help students to understand the teachings of the texts as well as possible. At Belmont Abbey College we have been extremely fortunate in our ability to attract faculty who possess the virtues described above. No doubt our serious commitment to our Catholic and liberal arts mission has a great deal to do with this. There are thousands of books that could be called “great,” in the sense of “influential on the development of Western civilization.” How do you decide which books to read? A very good and difficult question. There are many ways that one could design a great books curriculum. I think it would be rare for even those who are generally in favor of such an approach to education to agree on the exact same booklist if given perfect freedom to develop their own. Our program had a number of guiding principles for selecting our books. First, and this made the task of selection extremely difficult, was that we were committed to limiting the number of texts in our curriculum in order to promote slow and careful reading rather than an encyclopedic knowledge of many great books. This means we were forced to leave many texts worthy of being called great out of the curriculum. With the limited space we had for texts, we then organized our curriculum around authors who represent three perspectives: the ancient, the Christian, and the modern. While there is certainly disagreement among the authors included in each perspective, we believe that each perspective has certain unifying approaches and answers to the fundamental human questions. Additionally, we have a number of courses designated as “textual analysis” courses. These courses were designed especially to highlight careful exegesis and writing and texts were chosen accordingly. There were a number of other considerations involved in the difficult process of choosing texts, but it would be too tedious to mention them all here. There are several famous Great Books programs at schools across the country, from St. John’s College, to Thomas Aquinas College, to the Core Curricula at University of Chicago and Columbia University’s Columbia College. What makes your program unique? Great Books programs like St. John’s and Thomas Aquinas College have students take the same four-year curriculum without choosing majors. Our program has this option as well. Students can take 120-credits in our distinctive great books sequence. 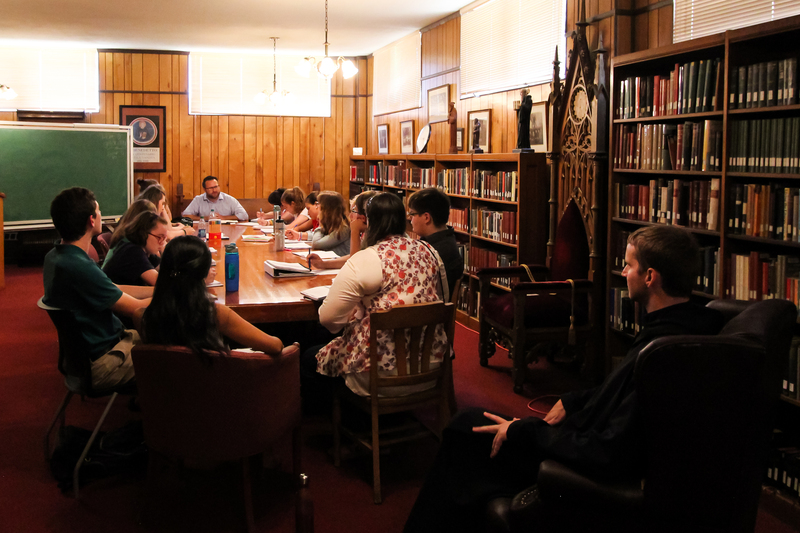 However, our program also allows students to take a 90-credit great books major that allows them to take 30 credits of electives in languages, internships, and regular minors offered at the Abbey. Finally, our program also has a 75-credit great books core and minor that allows students to take any other major offered at the Abbey. This benefits students who, for example, might wish to have the biology background necessary for medical school but who still value the great books or for students who wish to take more "professional" majors. Besides the flexibility mentioned above, the most distinguishing feature of our program is our senior year curriculum which focuses on the "crises of the West." These topical courses put the wisdom of great books into dialogue with contemporary scholars who are examining the causes and possible solutions to a number of contemporary crises. Course titles include "History and The Idea of Progress", "Science and Technology," "The Drama of Modern Atheism," "Modernity: The Poets Vision," "Globalism, Nationalism, and the Limits of Commerce," "Freedom, Rights, and Virtue" and "Education and The Fate of Nations." Such courses prepare our students to engage thoughtfully in the world they will enter after graduation. Many are worried about the ever-increasing cost of higher-education. Four-year tuition at some private colleges can run in excess of $200,000. How much does the program cost and what efforts have you made to keep it affordable? I think this is one of the areas where our program is extremely competitive. As a private school, Belmont Abbey College is generally extremely affordable with our tuition being only $18,500 per year. It has remained at this rate for the past four years. Currently, admission to the Great Books Honors College comes with a $9,000 per year scholarship which brings tuition down to $9,500. Room and board is approximately $9,000-$11,000 making a yearly total of tuition, room, and board 18,500-20,500. This means that a residential four-year great books education would cost approximately $80,000. Great Books programs are not geared toward career-training, yet students will need jobs once they graduate. What is the relationship between a liberal arts/great books education and employment, in your opinion? Which great books have been most influential on your own thinking? Which do you find disagreeable? I would begin by admitting that I am still very much a beginner when it comes to the great books. While I have become convinced over the years of the superiority of this type of education, I did not experience it until some of my undergraduate courses and in graduate school. I have made some progress in the great books of political philosophy, but I still have very many great texts to read. The ones I have read require many re-readings on my part. Now that you have full disclosure of my beginner status, I would say that the three books that have been the most influential on my own thinking, and that I would recommend to my students if they could only read three great books (besides the Bible), are Aristotle's Nicomachean Ethics, St. Augustine's Confessions, and Alexis de Tocqueville's Democracy in America. One of the main reasons that the great books have been so attractive to me is that they have helped me to sort through understanding my own soul. "Know thyself," as inscription above the Temple at Delphi is reputed to have said. In my experience, these three texts have helped me to better do this. Aristotle's Ethics have helped me to understand the natural causes and impediments to human, and therefore my own, happiness. St. Augustine's search for happiness in his own philosophic and theological quest presented in the Confessions helped me begin to understand the role played by grace in my own happiness. Finally, following the ancients like Plato and Aristotle, I have come to believe that the souls of citizens are greatly affected (though certainly not determined) by their regime. Thus, as an American living in a modern liberal democracy, I need to understand the relationship between democracy and souls to understand myself. I don't think anyone has a better understanding of the effects of democracy on the soul than Alexis de Tocqueville. This is especially apparent in Volume II of Democracy in America. As to books I find disagreeable, I suppose I would say there are many authors with whom I fundamentally disagree, but who are able to raise questions in a way that has helped me progress in my own thinking or who possess limited truths that have helped me to think through important matters. As a quick example, I find a great deal of the teaching of Jean-Jacques Rousseau to be problematic. Yet, some of his account of what causes our unhappiness, particularly his account of amour-propre, seems to hit upon something. On the other hand, there are many great authors whom I agree with that I do not enjoy reading because of their manner of writing. I would just emphasize how excited we are at Belmont Abbey College to be founding a great books program that we hope will fill a very important niche. We believe that there are many students out there who wish to engage in the pursuit of wisdom concerning the perennial questions through a distinctive great books curriculum but who might also wish to take a traditional college major. We hope that the program will bring many more morally and intellectually serious young men and women to join our community here in North Carolina. The students we have already recruited after launching the program only two months ago and the organizations like ACTA that have showed interest in it, give us reason for this hope. I would add that I would be delighted to speak to any interested parent or potential student who can email me at josephwysocki@bac.edu. Finally, I would like to thank ACTA, and more particularly you Shaun, for being willing to share the news of our new program. You are all doing much-needed work in the field of higher education. I remember Dr. Thuot and hope he is well.